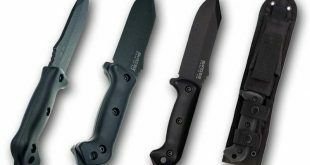 It’s critical to select a versatile tactical sharp blade from thousand of low-quality products. This Benchmade Bushcrafter fixed blade Knife is made for extreme survival use. 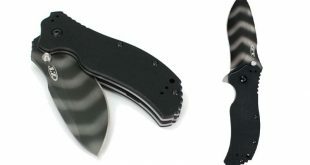 The famous blade designer Shane Shibert designed this best tactical knife and made the blade perfect for self-defense use or outdoor trips or utility work. If you use to go on long hiking trips in the mountain area, rainforest or desert then this knife will be your best choice on the way. The knife is sharp enough to cut a frozen rope, wood or any plastic materials. The whole knife elements and sheath made in the USA. Let me give you a complete Benchmade Bushcrafter Knife Review. The core of the blade is made of super high-quality S30 V stainless steel. The Benchmade Bushcrafter fixed blade is a full tang knife. The blade structure is solid, well-balanced, functional and features premium steel. The razor-sharp blade has stainless steel polish coated around the blade surface. It is a high stage drop-point blade. The manufacturer has used extreme quality CPM S30 stainless steel for making the 4.40 inches blade. This high stage drop-point blade is perfect for extreme use. The HRC 58-60 rated sturdy steel has made the blade far superior to anything else. The 0.164-inch thickness blade is suitable for hard-working use. The blade comes with a sharp 90-degree bevel, so it allows user throwing sparks with a Ferro rod. The most practical side of the Benchmade Bushcrafter Knife is it can be your right choice for hiking or campaign at any remote place like mountain area or rain forest. The S30 steel of the blade will allow you re-sharpen easily. You don’t need specialized diamond or Ceramics to sharpen the blade. You can make the edge sharper even by river rock. The blade has a polished finish and incredibly well crafted that protects it from extreme weather and salt water. The handle is the most important part of any tactical knife. Holding facility and shape of the handle ensure comfort while cutting anything. The Benchmade Bushcrafter Blade comes with hand mixed and contoured green G-Ten (G10) handles with red vulcanized spacer held mutually with squeezed titanium tubing. This titanium tubes hold the hands tight together. This G10 handle with Volcanized spacer will ensure comfort feeling and grip in your hand. 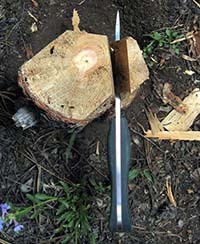 The green handle’s innovative design allows the user for secure holding and successfully using it during chopping or cutting wood or making fire. When you hold the knife, your two fingers will touch the holes of those titanium tubes into the handle and provide you maximum grip. Down of the handle, there is a lanyard hole for hanging it on a cord around your neck. 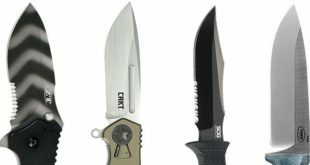 A best tactical fixed blade knife is an essential accessory, especially for the adventure seeking person. 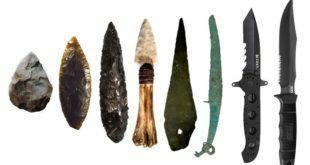 They always require a blade which can be used for cutting the sticks, a branch of the tree, shelter craft, processing firewood and so on. If you love adventurous hiking or journey in any dark forest, you must need a perfect survival knife, which allows you to cut the wood, plastic, heavy duty camping or anything else to surviving any remote place. This Benchmade Bushcrafter Knife is specially designed for accomplishing such types of tasks so efficiently. Even the S30 stainless steel is sharp enough to cut any rope, thick cloth or leather which you must need for surviving any remote place. Moreover, this versatile knife is very useful for hunting, skinning and making fire and food. 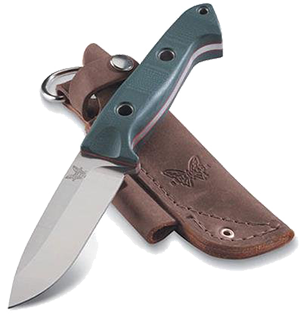 The Benchmade Bushcrafter fixed blade Knife co mes with an excellent long-lasting sheath. The sheath has a D-ring; it helps the user to bring the knife with a jacket or bags. Furthermore, the flint rod loop with this sheath allows users to carry it easily. The sheath also comes with a retention leather strap that is tighter with an iron button snap. Another pleasant thing about the Benchmade Bushcrafter Blade is the brushed full-grain 100% buckskin leather sheath. The design of the sheath is traditional, which takes attention at first glance. This sheath is made of high-quality 100% buckskin leather, so the sheath ensures sustainable usages even you do rough use. The sheath has a D ring on the top and there is a loop for keeping fire steel. The buskin lather is good enough to protect the blade from any other difficulties like from the water or vapor. The smooth outer shape of the sheath feels so good when you touch it. Such type of sheath is capable of tolerating all kind of bad weather. You can easily attach it both side of the waist. On the top of the sheath has a belt loop with a stainless steel button for keeping the knife tightly into the sheath. Also, there is a lanyard hole bottom of the sheath. Not suitable for regular chopping. Question-1: The website shows a D-ring with the sheath, Is that correct? Answer: Yes the sheath comes with a D-ring which makes the Knife suitable for caring. Question- 2: Is the knife’s hollow ground is made of stainless steel? Answer: The knife does not have hollow ground, it has flat ground, and yes, it is made of stainless steel. Question-3: Is the knife good for chopper or splitter? Because of, the length of the blade is short. Answer: The blade is thick, so it is not very good for chopping, but it is ideal for splitting, and the blade length does not make an issue. Question-4: I want to know is the blade good for everyday use? Answer: Okay, if you live in a mountain or near the forest or camping such area then this one will be your perfect choice for hunting, tactical use, cutting wood, survival, etc. But if you live in a city and do not need a knife for heavy use then it is not for you. Question-5: Is the G-10 handle black or green? Actually, I have found both colors handle on a site. Answer: The G-10 handles are the lighter green and have a flat finish. It’s truly essential to choose a sharp and strong cutting edge for an extreme adventure. The Benchmade Bushcrafter Knife is well-balanced, functional and robust with a premium steel blade. Besides, with this strong thick tactical fixed blade, you can make some critical task; usually, that is so hard for an ordinary knife. The best combat knife is always considered as an especial blade which allows you to use friendly for any kinds of work like as -wood cutting, skinning or campaign, and any extreme work. 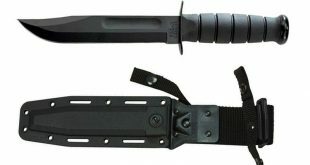 I think you need to add this best knife with your backpacks before going out for a surviving trip. Hi there, I have read your review. I know Bushcrafter is one of the best knife producing brands in the word. 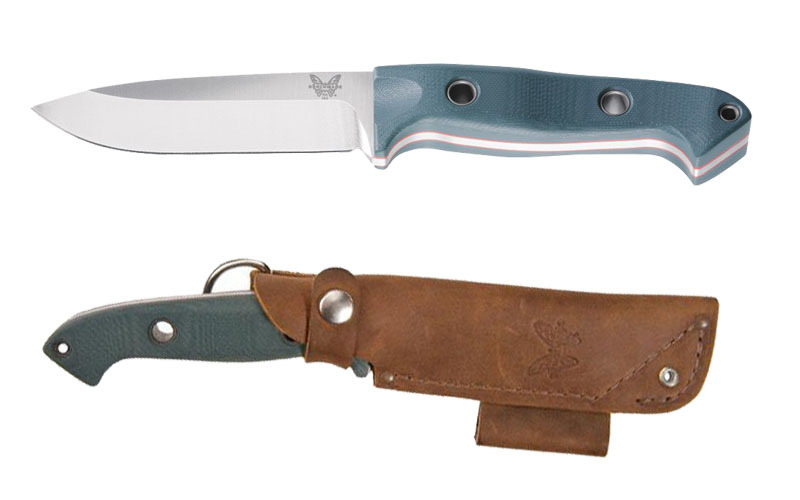 I want to buy a Benchmade Bushcrafter Knife, and this model is suitable for me. But when I was searching the review of this knife I have found lots of similar design like this. I am a little bit confuse which one is best for me. I want to use it for survival, hunting, and tactical work. Would you please tell me which one will be best for me. Thanks. Hi, Darryl Shomaker, first of all, I want to give you thanks for visiting and asking me an effective question. There are dozens of models of this Benchmade Bushcrafter Knife. Also, they are so much similar and difficult to identify those individually. Eash of the knife has been designed for a particular work. Though this model is best of all and a perfect knife for survival, hunting, and tactical work, I will suggest you to buying this. I am searching for a multi tasking hard to beat all rounder knife. Suitable for hunting, skiing, making the tent and cutting wood. What do you say man? I already have a Benchmade Bushcrafter Knife (not this one) but I have broken it. So need a new one. After reading this review I think this would be my perfect knife, expecting your opinion. Hello, Thomas Steve, thanks for the comments and your question. I am so sorry to know that I have Broke one of the Benchmade Bushcrafter Knife. 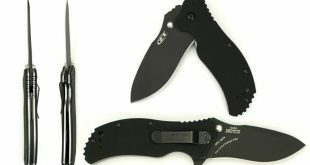 You know all the Benchmade Bushcrafter knives are known as world’s strongest knife. Anyway, this model is the best and most durable knife in the entire Benchmade company. I have already described all the features information and benefits of this fixed blade on above review. SO you can take it without thinking twice. Have a great hunting. Found your blog from google. I was searching this particular product review and also have found some of the product reviews, but they are not good enough. Then I have seen your blog, and you already included all the review details those I am searching for. You have done a great job. 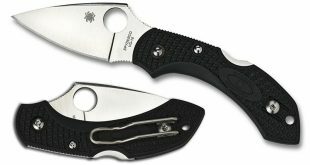 I am looking for a flexed blade for extreme use in different circumstances. After reading your blog post I browsed your website and found this Benchmade Bushcrafter Knife that has really good strength according to your review. Also, I am hardly seeking this kind of useful blade. The bade is made of heavy metal and it is so thick for cutting any hard element that what I am looking for. Thanks to you for a great review.